A wickedly funny black comedy, and an astutely observed rumination on modern masculinity, Force Majeure is the eagerly anticipated new film from Ruben Östlund (Involuntary, Play). 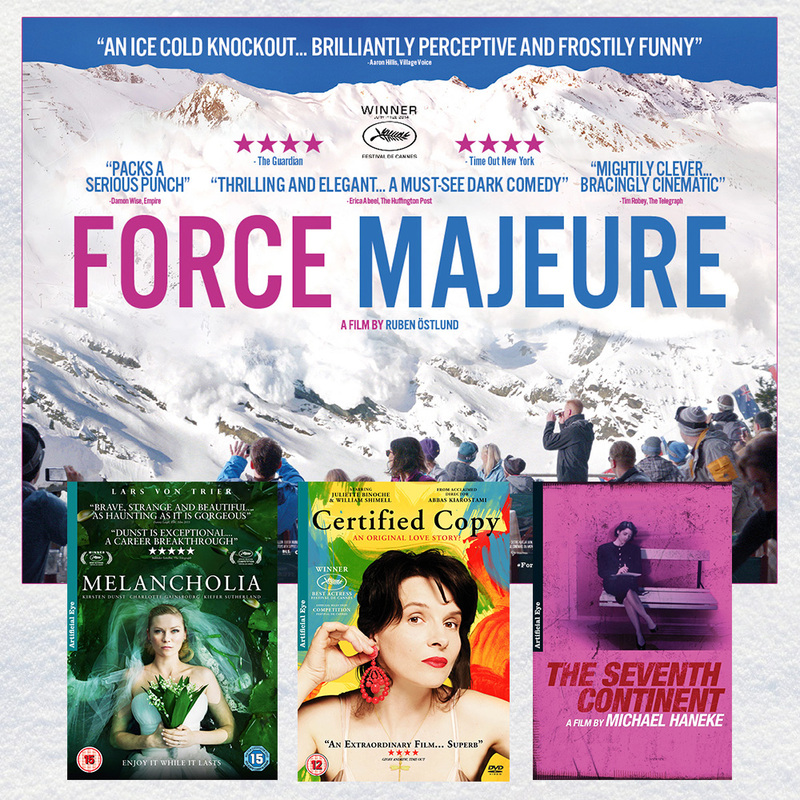 To mark its opening we have a fantastic bundle of auteur dvds to give away together with a Force Majeure poster, courtesy of the film’s distributor Curzon Pictures! Tomas (Johannes Kuhnke) is on a skiing holiday in the alps with his beautiful wife Ebba (Lisa Loven Kongsli) and their two desperately cute children. He seems to be a man who has it all, yet, while enjoying lunch on a restaurant terrace overlooked by stunning mountain views, there’s an avalanche that sends Tomas running away from the table in fear of his life, leaving his family to fend for themselves. The avalanche passes and no one is hurt, but Tomas’ actions have left his family shaken and the future of his marriage in doubt. He sets about trying to prove himself a proper and decent patriarch. Force Majeure was winner of The Dublin Film Critics Circle Award for BEST DIRECTOR for Ruben Östlund at the Jameson Dublin International Film Festival last month, in addition to having garlanded numerous awards around the world since it premiered at Cannes last year and took the Un Certain Regard Jury Prize. Celebrating the release of Force Majeure, we have a bundle of DVDs featuring three outstanding contemporary auteur directors, Lars Von Triers, Michael Haneke and Abbas Kiarostami. To enter, simply answer the question below and we will pick a winner on Thursday April 16th. Director Ruben Östlund started his career making films about what sport?